Pyukumuku in game: 808 Who? Important notice! 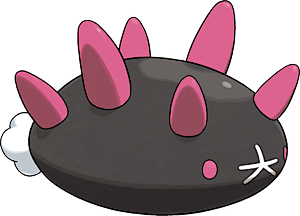 Pokemon Pyukumuku is a fictional character of humans. 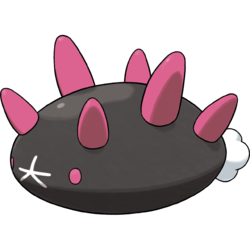 Pyukumuku (Japanese: ????? Namakobushi) is a Water-type Pokémon introduced in Generation VII. Pyukumuku is a marine Pokémon with an ovoid, black body. Its face has two beady, pink eyes and a white mouth shaped roughly like a star or Daimonji. This Pokémon is capable of spitting its organs out through its mouth. The white organs typically take the shape of a fist or stay in the same shape as its mouth. Two lines of three pink spikes run down each side of its back. The middle spike of each line is about twice as long as the others are. A fluffy white puff forms its tail. A wild Pyukumuku appeared in Alola to New Adventure!. 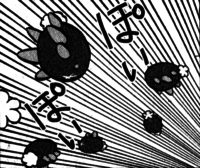 Pyukumuku first appeared in the Sun & Moon chapter. Sun was hired by a pair of Team Skull Grunts to remove several wild Pyukumuku from a beach Team Skull considered their territory. Another Pyukumuku was secretly planted by the female Grunt in order to get out of paying Sun for the job. Namakobushi may be a combination of ?? namako (sea cucumber) and ? kobushi (fist).